Painting fur, whether wildlife or domestic, covers a range of techniques: This hare has short fur around the nose and muzzle, medium fur on its body and longer fur on its hind legs. It’s tail is fluffy and all over its body it has long whispy fur appearing from the thicker main coat of fur and long fine straggly hairs coming from its ears. The fur on its neck and under its chin are longer and thicker. 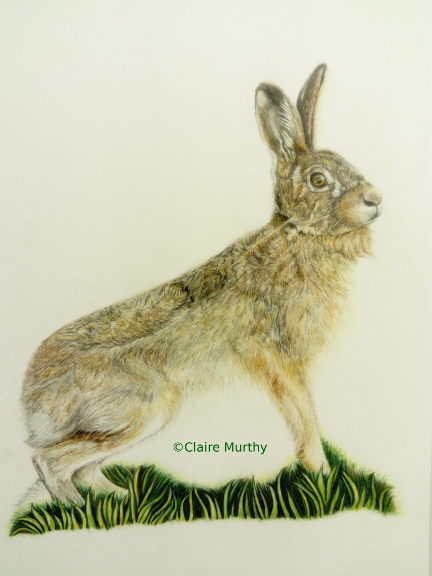 Other types of fur on a hare includes whiskers, eyelashes and eye, so brow hairs, so plenty of variety to practice drawing and painting fur. More information about drawing fur and painting wildlife, coming soon..